Properties in Nicaragua average 4.6 out of 5 stars. Luxury San Juan Rental House...Stunning Views, Pool, Location! Property 4: Luxury San Juan Rental House...Stunning Views, Pool, Location! 5 Br/ 4.5 Ba House W/ Pool. Just 5 Mins Walk From Beach & Surf Breaks! Property 15: 5 Br/ 4.5 Ba House W/ Pool. Just 5 Mins Walk From Beach & Surf Breaks! Property 19: Casa Perla Beachfront "Tona"
Property 26: NEW! Spectacular Ocean view Home in SJDS minutes from town with private pool! Majestic Coastal Palace w/ Private Pool and Concierge Service! Property 33: Majestic Coastal Palace w/ Private Pool and Concierge Service! Property 34: Hilltop home with pool, terrace & incredible ocean views - walk to beach/town! Property 36: Beautiful Beach House Right on the Ocean Sleeps 12! Property 40: Long-term discounts: Oceanfront villa w/ private pool, sea views, near beach! 3 Bedroom With Plenty Of Breathing Room! Property 46: 3 Bedroom With Plenty Of Breathing Room! Magnificent Views! See & Hear the Surf! Infinity Pool! Pure Paradise! Property 50: Magnificent Views! See & Hear the Surf! Infinity Pool! Pure Paradise! This house is truly amazing! Casa Perla EXCEEDED expectations in that it had everything a family of 8 was looking for. The kitchen is well equipped, the lounge/seating areas were perfectly laid out, the individual bedroom/bathrooms offered plenty of space and privacy and the view and location of the house made it feel like we were the only people around. There is a town down the road that was fun and offered activities and incredibly dining options. Karina made sure that we had anything and everything we needed while we were there (she set up a fishing trip, helped with dining/shopping options, arranged manicures/pedicure/massage people to come to the house for a day of pampering and offered history/information on the country.) She was wonderful to deal with! Also Casa Perla offers a maid to come in and clean daily, or as often as you desire, which was amazing to come back after an adventure to an impeccable house. My family and I usually don't return to a place more than once but this place has something very special to it and we have already started looking at our calendars of when our next visit will be! I can't say enough about how wonderful and luxurious this house is. STAY HERE!!! 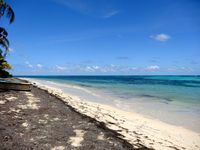 Takes a little effort to get to the Corn Islands but of course it&rsquo;s worth it..! My girlfriend &amp; I Spent 3 nights on little corn @ Nicks house but wished we could have stayed much longer! We were able to arrange everything we needed (including a fridge full of cold beer apon arrival and a private boat back to big Corn apon departure) A very special place to stay!